Does your little infant already have a penchant for monkey business? Maybe your little one is ready to transform into a monkey. All you need to do is take this quick little quiz to see if your baby is a monkey business expert. If you answer “yes” to any of these questions, then you may want to think about dressing your baby up in this infant Huggables Monkey costume. Does your baby have a strong preference for banana baby food? Does your baby like to bounce around nonstop for what seems like an eternity? Does your baby ever make noises that go “Oooh, oooh!” or “Ahh! Ahh!” much like a monkey makes? Does your baby display a high amount of curiosity? Does your baby like to play games of Monkey See, Monkey Do? If you said, “yes,” to any of those questions, then it’s time to turn your baby into an adorable little monkey! This infant monkey costume has a unique design that allows your baby to cling to you more easily, making your little one look that much more like a little simian baby! It’s made of a polyester fleece fabric that’s soft and warm. The arms fit with velcro fasteners that can fit around your neck. Finally, the little hood has a tiny monkey face designed right into it, which is perfect for a little bit of monkey mischief! 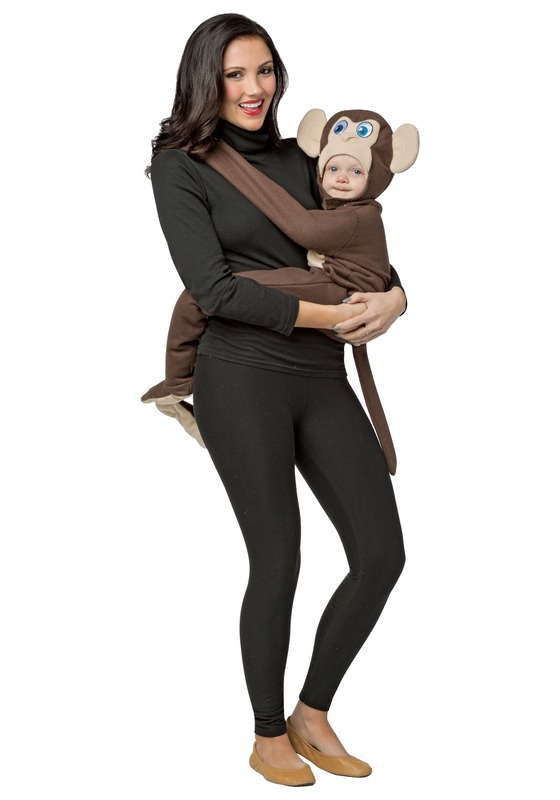 You could even make a great Jane Goodall and monkey parent-child costume for the both of you with it.